Nestled away from the hustle and bustle of Tioman Island, visitors to Tanjung Resang are usually seeking the best of both world -- sand and sea on one side and a dense tropical jungle on the other. There's plenty here to satisfy eco-warriors and dare-devil adventurers, as well as the laid-back beach-dweller. Fly or drive south to Johore Bahru, which is about a 4 hours' drive from Kuala Lumpur. Exit the highway at Ayer Hitam (or Simpang Renggam if you're coming from the south), and make your way to Mersing via Route 50. 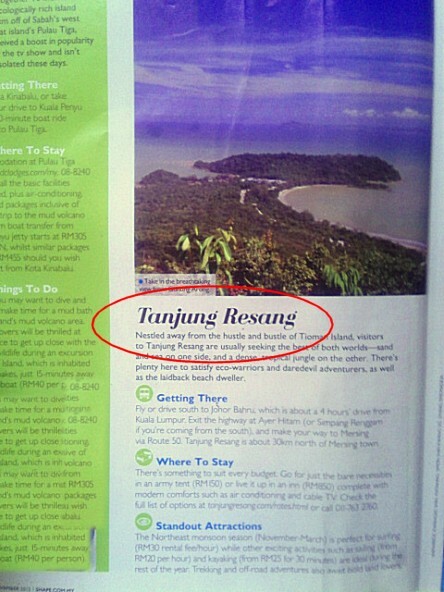 Tanjung Resang is about 30 kilometers north of Mersing town. There's something to suit every budget. Go for just the bare necessities in an army tent or live it up in the Sunrise Inn, complete with modern comforts such as air conditioning and cable TV. The Northeast monsoon (November - March) is perfect for surfing, while other exciting activities such as sailing and kayaking are ideal during the rest of the year. Trekking and off-road adventures also await bold land lovers.